I'm generally prone to rolling my eyes and this morning is no exception. After reading the New York Post this morning, I'm feeling dizzy after rolling my eyes at nearly every sentence of this article. 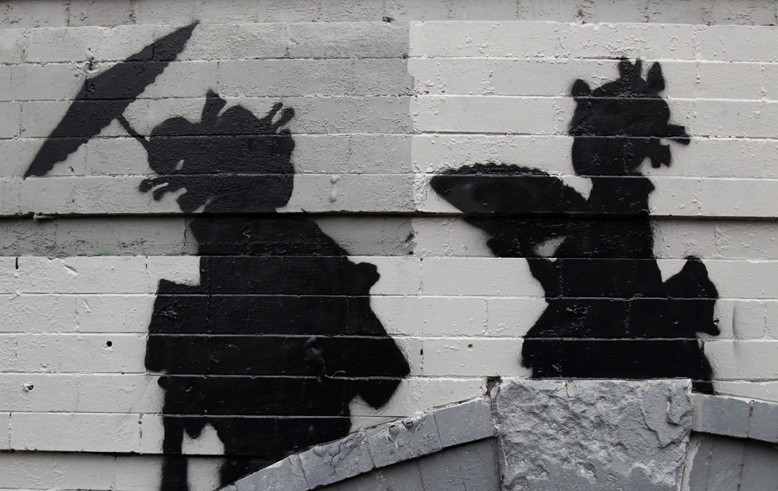 The NYPD and Mayor Bloomberg are after Banksy for vandalism. Bloomberg expresses that Banksy is a vandal, not an artist. The NYPD are using every tool they have and "are scrutinizing all surveillance videos they can find from areas where the guerrilla artist has left his famous wall-art stencils. If they catch him, he will be charged with vandalism." As someone who was just in NYC, I can say that catching Banksy is the least of NYC's problems. Banksy knows he is a wanted man, but it doesn't seem to phase him. "I don't read what I believe in the papers", he shares on his website. The heat from the NYPD hasn't slowed down his month long residency. A new piece showed up in Brooklyn today.